The Turducken is a chicken inside a duck, inside a turkey, filled with stuffing. Vegetarians refer to this as a “mass grave on a plate”. 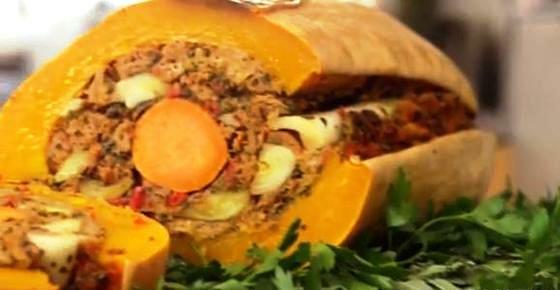 The non-meat solution is the Veggieducken, a sweet potato inside a leek, inside a banana squash, filled with stuffing. 1 large yellow onion, roughly chopped. 3 red bell pepper, stems and seeds removed, roughly chopped. 2 cups fresh flat-leaf parsley, loosely packed. 1 cup fresh sage, loosely packed. into a large bowl and set aside. Add to the bowl with the onion mixture. of the bowl, and cook, stirring often, until softened, about five minutes. and pulse until finely chopped. Transfer to a large bowl. pepper and remaining olive oil, stirring to combine. Let set until cool enough to handle. Make a stable bottom by slicing about 1/2 inch from one of the halves. Press about 2 cups of the onion stuffing into the bottom squash cavity, making a hollow space in the center. create a hollow for the yam. pressing firmly to set in place. when a wooden skewer slides easily into the center. Posted on November 20, 2012, in Food, Recipes and tagged stuffed banana squash, Turducken, vegan Thanksgiving, Veggieducken. Bookmark the permalink. Leave a comment.